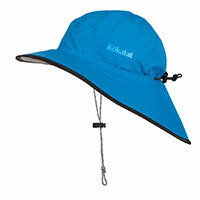 Rain or shine the Kokatat Hydrus Seawester is a comfortable and floatable kayak hat keeps the sun or rain at bay. This durable waterproof breathable paddling hat features Kokatat's proprietary Hydrus 2.5-layer fabric. T mesh lining with Polartec® Power Dry® forehead liner and non-glare brim and floatable foam bill keeps you dry in the rain or protected from the sun. The bungee adjustable headband and draw cord chin strap will keep the hat on your head in a breeze.